Cocoa Beach has seen it all. As one of the cities nearest to the booming space race of the middle 20th century, the town has been in an exclusive historical position to be visited by a revolving door of presidents and astronauts. Established all the way back in the 1920s, in many ways, it was, and still is, considered the heart and soul of Florida’s Space Coast. Pieces of that history are all still there, delighting visitors and locals alike on a daily basis. Cocoa Beach thrives on nostalgia. Many of the hotels and motels that housed the creators of the space age, and have the signature design of the era to prove it, are still there today. The La Quinta Inn, formerly the Cape Colony Resort, is one such place. Search for the plaque that’ll explain the role of the Mercury 7 astronauts by the motel’s pool area. Also, bring a copy of Tom Wolfe’s The Right Stuff with you, and check for the landmarks in Cocoa Beach he mentions in that iconic book. Most are still there. The space legacy continues, making new history: rockets launch all summer long on various days. NASA’s manned Orion program is being worked on at this very moment, and Elon Musk with SpaceX plans to launch for Mars, right here on Florida’s Space Coast with the Dragon module starting in 2018. A good place to view all this is the Cocoa Beach Pier, close to the action and sitting regally amongst the calm surf. You’ll be written into history. But outside of space, Cocoa Beach has some more history to be explored. Surfing, for one. Eleven-time world champion, and greatest surfer to ever live (this is no real argument locally or worldwide), Kelly Slater grew up on the soft waves of Cocoa Beach. 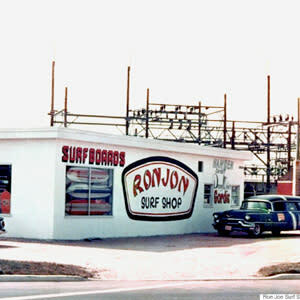 Take a picture under the sculpture created in honor of his signature wrapping-turn-right in front of the equally famous Ron Jon’s Surf Shop. Ron Jon’s opened in 1963 as a second store to the original in New Jersey. It had humble beginnings as another little East Coast corner surf store (the old building is still on the same corner, under different tenants), and since has grown to become a surf emporium open 24 hours a day, 7 days a week, 365 days a year. Cocoa Beach just thrives on its vintage nature, which sits often in plain view, but also can be obscured just slightly by the booming modernity of 21st-century life. Check out this collection of vintage Cocoa Beach memorabilia on Pinterest for a step back in time. It’s the kind of place where every street has a story, and every story has a street. Come for the history, but stay for the future.